To Purchase go to AMAZON now! Just click here! Paw Patrol Winter Rescue is only $12.74 with free shipping and makes the perfect gift or stocking stuffer! Get your little one a copy today! New York, NY – August 20, 2014 – Prepare for an icy adventure this holiday season! The PAW Patrol pups are back for 7 wintery missions that include a double-length adventure to save Christmas in this new DVD set. From a ski-lift rescue to tracking down a snow monster, no job is too big and no pup is too small. Plus, see how Rubble first joined the team by helping out in a snowy situation! Full of festive fun that fans won’t want to miss out on, this DVD set makes the perfect holiday gift for fans. Produced by Nickelodeon Home Entertainment and distributed by Paramount Home Media Distribution in the US. 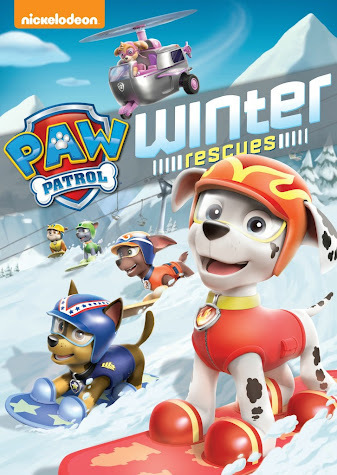 PAW Patrol: Winter Rescues will be available on DVD on October 7, 2014.